I wrote this poem recently when the death of a cousin brought our family to a temporary halt. The grief of her immediate family was intense, even though she was given a year to live and they knew she would pass away. She survived for 10 months. Still it was a hard thing to go through. Maybe you will identify with this poem. If so, I hope it will bring your some comfort in your losses, whatever they may be. Sometimes we get some surprises in life and it almost seems that the little ones are the best. When I was 15, I had a back operation for scoliosis. During my recovery for 6 months, I was confined to my bed in my bedroom at home. A few people visited, others sent cards or letters, but mostly I was alone. One thing that delighted me was an arrangement that an Aunt sent me. It was a deer vase with philodendron planted in it. I loved to look at that deer, and kept it by my bedside so I could view it as often as I liked. Over time the philodendron grew too large for the vase and had to be transplanted. I never planted anything else in it. As time when on, I lost track of the original vase and my memory of it. But one day in 2016 I remembered it and wondered if a replica could be found on the internet. I searched but came up with nothing, so I eventually gave up in frustration. Then in July of 2017 after turning 65, I was visiting a resale shop not far from my house, and was almost done looking at everything they had. I turned a corner, and on a bookshelf was the exact deer vase. I was delighted!!! The price was reasonable, so I bought it and brought it home. It took 50 years for me to be reunited with something from my childhood. I’ve visited countless resale shops over the years but have never run across this deer. Not that I was looking for it, but I would have recognized it and bought it, if I had ever seen it on my prior visits. And the fact that when I began to think about the vase again after all of these years, I suddenly discover it nearly in my own backyard! I doubt that this one is the same one I had as a child, but it is making new memories for me to attach to the old. Below you can see the current vase with more appropriate foliage planted in it. It looks like the deer is jumping through a thicket rather than being overwhelmed with plant life. I am enjoying this new vase and reliving the memory of the old one. This is not a huge surprise that entered my life, but it certainly is a welcome one! Beauty – Can you see it? Beauty can be illusive if we are in a hurry, distracted, on a roll somewhere, or just n ot paying attention. At times I take some time out with my camera to search for beauty. You really have to give yourself the luxury of time to see and think about what you are seeing. Often we are too busy to do this, but it is an essential part of life and living a healthy life-style. If you engage in pessimism much of the time, taking time out to find and reflect on beauty may be contrary to your nature. After all, you are very focused on digging up what’s wrong with life, not what’s right with it. It would almost seem sacrilegious to look for the good. You would have to risk getting out of your comfort zone for a few moments to see the beauty around you. I hope you will. I bought this rose and inserted it in a small vase I had. I sometimes like to bring natural beauty into my indoor world to remind me that there are beautiful things around. Perhaps it’s the fact that I am a woman and a rose is a flower. And you know women and their flowers … smile. My mother used to say, give me flowers now because I won’t be able to see the ones you give me at my funeral. She had a point. 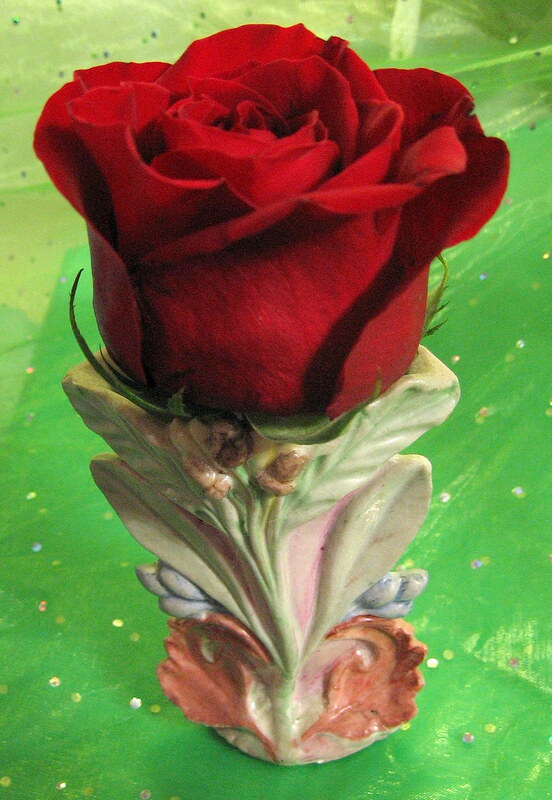 This is a rose that I drew and used for several things. It was used to decorate the front of a Mrs. America Brochure, and then I stippled it and used it for note cards. These are ways we mimic beauty and bring it into our personal worlds. Of course nature isn’t the only thing that’s beautiful. Sometimes a situation can hold beauty in ideas, or happenings. People can be beautiful in the way they look, act, or talk. Writing can be beautiful, when we put our thoughts and ideas on paper. So there are many avenues of beauty around us, we just need to stop and notice them more often than we do. What kinds of beauty do you appreciate? Share them with us. When I want to catch a few minutes of relaxation, I usually pick up a book. That’s unusual because I really am not someone who typically likes reading. I mean I don’t have the passion that some people do of not being able to live without a book. They seem gagga over books of any kind. I’ve never been like that, probably because I am a visual person. I go gagga over looking at pictures. But over the last 8 years or so, the county libraries have been selling their books. Usually I can pick a paperback up for maybe 25 cents depending on the library. Some want more. At any rate, this gave me the reason to read and I chose Amish Romance Novels. I was attracted to the stories and how the authors tried to depict Amish life realistically but also include the old type of boy meets girl and live happily ever after idea that I grew up with. Little by little I discovered other authors dealing with life in the old west, the Norwegians making a life here in the USA, etc. I like that era and a simpler time or way of living. A friend of mine was an actress in a movie put out last year in Sugarcreek Ohio. The title is “Love Finds You In Sugarcreek”. My friend Marianna Alacchi played the part of Anna Troyer, an elderly Amish woman with a mental disability. I especially liked the part in the movie when she sat on the person who tried to murder her niece to keep her from getting away before the police could arrest her. It was a wonderful movie. So that’s what I do to entertain myself or relax. Some stories are hard to get through and take me more time to get with their program. But others I like right off the bat. What do you do to entertain yourself? I’m sure you are far more adventuresome than me. Although some day I’d like to try Ziplining at Tree Frog Canopy Tours, here in Ohio!